The model for these jacks was a specimen discovered at an archeological dig. Although the set comes with both rubber and wooden balls, the period method of playing used no ball. 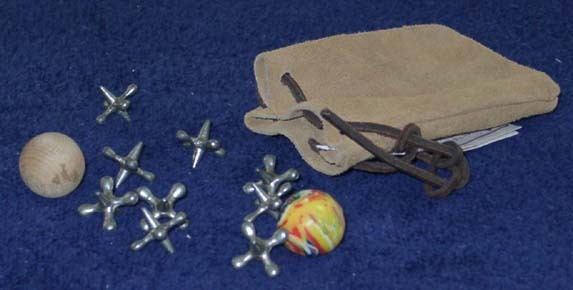 All the jacks were cast and then the player chose one of the jacks to toss. This jack was then tossed up while scooping up another jack and then catching the tossed jack before it hit the ground. As long as the player was successful in scooping a jack and catching the tossed one, his or her turn continued. If all the jacks are picked up successfully one by one, then the jacks are cast again and the process repeated except that two jacks are picked up with each scoop. And so on through three's, four's, and so on. If you wish to use a ball, use the wooden ball like the tossed jack described above, that is, it is caught before it hits the ground (it doesn't bounce well) or use the rubber ball and catch it on the first bounce. The cost of a set of jacks is $7.95.